On the 29th June, Iñigo Azpitarte (the singer of ‘Indigo band') was interviewed on Eitb about his music and his new EP ‘Out of here'. Here (http://www.eitb.com/eu/audioak/osoa/2369768/audioa-indigo-inigo-azpitarteren-musika-proiektua--amarauna/) you can listen to the interview and 3 songs from the EP (‘Wrong', ‘Playing' y ‘Heart'). 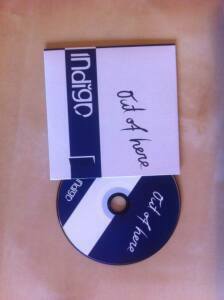 You can get hold of a copy of the EP at one of his concerts or through Indigo Band's facebook page. (https://www.facebook.com/Indigo0Band). Thanks to Acordes Urbanos, we discovered ‘Sammy Jankis'- a folk-pop band from Burgos. The songs are melancholic and are inspired by the life of the singer, Alfonso Gutiérrez, as well as stories about his friends. They've got a bandcamp page (http://sammyjankis.bandcamp.com/) and their website is http://www.sammyjankis.com/ .